In an essay on “Honen’s Religious and Social Significance” (Hawaii Pacific Press, December 15, 2010), we mentioned that Nichiren (1222-1282) was infuriated at the popularity of Honen’s Pure Land teaching and wrote a text: Nembutsu (brings) Uninterrupted Hell [Nembutsu muken jigoku].” In this essay we will discuss Why Nichiren was so opposed to other Buddhist teachings and his religious and social significance. He was one of the most colorful and distinctive teachers, perhaps in the history of Buddhism and sometimes compared with the Prophets of the Jewish Bible or Old Testament. He was the most persecuted Buddhist during his lifetime and the most despised in history. His life and teaching does not fit the pattern of a modern Buddhist because he criticized the government and the Buddhist sects of his time and was seemingly the most intolerant teacher, offending the ideal of tolerance that has been a hallmark of modern Buddhism. Because he has been so maligned in modern times, we should understand Nichiren’s peculiar role in Japanese Buddhist history and his perspective on Buddhism. Nichiren was a child prodigy. He was born in the distant seaboard area of now Chiba prefecture in Kominato as the son of a fishing family. Unlike many major teachers he was from a low social class. He described himself later as an Icchantika, a person with no capacity for Buddhahood. Essentially an outcast. Because of his recognized abilities as a child, however, he was sent to a local Tendai temple, Kiyosumi-dera, for education. He learned to read and write. Again, because of his abilities, he was sent first to a temple in Kamakura where he studied Zen and Pure Land, and then on to the Tendai monastery on Mount Hiei, the Harvard University of his time. He expressed a desire to become a leading scholar of Japan before the image of Kokuzo Bodhisattva (Treasury of Emptiness [Space]. Kokuzo was the patron of education and arts. His erudition is reflected in his writings. On Mount Hiei Nichiren subsequently studied the Tendai teaching intently based on the centrality of the Lotus Sutra as the final teaching of the Buddha Sakyamuni’s lifetime. His aim was to restore the purity and primacy of Tendai teaching. Saicho’s Tendai teaching was syncretic, including many studies such as Zen, Pure Land and Shingon practices. However, Nichiren interpreted it in a more exclusive way, focusing solely on the Lotus. In this he differed from Saicho. Nichiren names no teacher on Mount Hiei as his particular mentor. Rather, he considered his lineage initially to be from Sakyamuni to Chih-i, the founder of T’ien-t’ai in China to Saicho, who brought it to Japan, and finally to himself. Later in his career he saw himself directly designated from Sakyamuni. Because of difficult experiences on Mount Hiei, he developed a strong sense of mission. When he returned home, he expressed his devotion to the Sun Goddess, Amaterasu, promising to serve Japan. As a result, he took the name Nichiren, Sun Lotus, by which he has been known through centuries. Nichiren was concerned deeply for the welfare of the nation of Japan. He came to see that it was threatened by civil war (the Jokyu revolt of 1222) which led to the exile of three Emperors, Emperor Go-Toba, the retired Emperor Tsuchimikado, and retired Emperor Juntoku, as well as by the prospect of foreign invasion (the Mongol invasion). Kublai Khan conquered Korea in 1258 and the invasion of Japan was in prospect. These two situations were part of a list of eight disasters that would result if a king or nation did not follow true Buddhism, here the Lotus Sutra, taught in the Ninnokyo Sutra. Seven had already occurred including famines, plagues, earthquakes, floods, fires, astronomical events-eclipses etc. and civil war. The final one, invasion, still to come, must have been known by Nichiren and the Shogunate with the advance of the Mongols in China. As a result of his sense of crisis, Nichiren composed the text: Rissho ankoku ron which means: Treatise on the Peace of the Nation (Through) Following the Truth of Buddhism and in 1260 forwarded it to the Shogunate ex-Regent Tokiyori in Kamakura. This year all Nichiren followers celebrate the anniversary of the presentation of this text as a remonstrance or admonition to the Kamakura Shogunate in the hope that the leaders would reject and abolish other teachings of Buddhism, adhering solely to the Lotus Sutra, as the Buddha’s final message. However, the Shogunate rejected his plea and persecuted him, sending him to exile in Izu. Subsequently because of Nichiren’s perseverance, he was beaten and eventually sent to be executed at Tatsunokuchi, the place for executions, However, he was miraculously saved and then sent to Sado island where he was condemned to die in that harsh environment. It is ironic that exile led to the spread of the teaching on Sado island and his life preserved. A similar situation took place with the banishment of Honen and Shinran and other exiles. On the frontiers there was no firm control by the government and the exiles survived to return another day. Nichiren’s sense of mission intensified over time, perhaps believing that he was the lead Bodhisattva Jogyo prophesied in the Sutra to emerge from the earth in the end time and spread the teaching of the Lotus Sutra. He declared that he was the pillar of Japan, the eye of Japan, the ship of Japan, perhaps meaning that he was the means for the salvation of Japan in that time of crisis. His repeated persecutions and suffering only confirmed his determination. However, surviving all his sufferings, he eventually retired to Mount Minobu 1274 where he witnessed the Mongol invasion. This momentous event is famous for the Kamikaze-Divine Wind which destroyed the Mongol fleet and save Japan. A second invasion came in 1281, also a disaster for the Mongols. However, the failure of these attempts at invasion did not conform to what Nichiren had predicted, but were attributed to the Shinto Gods. One result was the emergence of Shinto, the native religion, since it was the Japanese Gods who brought this about. Shinto faith and scholarship flourished after these events. Nichiren was disappointed at these events and suffered ridicule. While some disciples were disillusioned, others later declared that Nichiren in compassion had prayed for Japan and his prayers were answered. Nichiren later died on Minobu. Today a main temple, Kuonji, of Nichiren-shu remains there with his tomb. Another main temple is Hommonji at Ikegami in Tokyo. His numerous disciples developed their own branches, particularly notable has been the Taisekiji of the Nichiren Sho-shu in Fujisawa, founded by Nikko, a leading disciple. Postwar it was associated with the Soka Gakkai lay movement, but following a dispute, they separated. Why was Nichiren so adamant in his belief? 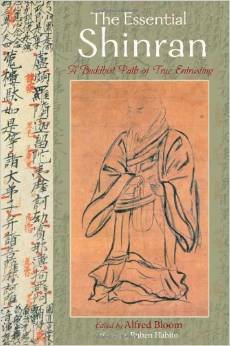 For this we must look into the Tendai teaching and the Lotus Sutra complex. The Tendai teaching is based in the interpretation of Sakyamuni’s life outlined by the Chinese T’ien-t’ai teacher Chih-i (538-597 ). Chih-i viewed Sakyamuni’s life in five stages, beginning with the Hinayana (presently seen as the Theravada Southern Buddhist teaching) through stages of Mahayana till finally teaching the Lotus Sutra and Nirvana Sutra in the last weeks of his life. As the last teaching, the Lotus and also Nirvana Sutras are viewed as the ultimate teachings of Buddhism which all should follow. It is also to be noted that there is not only one Lotus Sutra but three texts in a complex like the Pure Land Three Sutras. The generally known Lotus Sutra is the second or central text The initial or introductory Sutra, Muryogikyo, quotes the Buddha saying that he had not yet taught the truth of Buddhism until he taught the Lotus (miken shinjitsu). Accordingly Nichiren maintained that to teach any other form of Buddhism, originating prior to the Lotus was to defame and dishonor the Buddha. The Lotus Sutra superceded all other Sutras, being the final teaching. From this standpoint, Nichiren also maintained that because of disrespect to the Buddha by the government and people of Japan who engaged in other practices, particularly Pure Land, the good gods (Shinto gods but also deities prominent as followers of the Buddha) had abandoned Japan, leaving it subject to demonic evils such as in the eight disasters. Because of his concern for the welfare of the country and exaltation of the truth of the Lotus Sutra as interpreted by Tendai, he appears to be intolerant, denouncing all other sects as false. He is famous for Four Denunciations in which he outlined the errors. Shingon is false because it destroys the nations. For Nichiren it was false magic. The nation would be protected by the Lotus. Historically the Japanese government employed Shingon rites whenever there was a disaster affecting the country. According to him, Zen is a teaching of devils because it held that one could become enlightened apart from scriptures. In Zen truth is beyond words and therefore it rejects the ultimacy of the words of Buddha. Pure Land nembutsu is a false way of salvation. Salvation comes only through the Lotus Sutra, particularly for Nichiren, reciting its title: Namu myoho renge kyo. The Ritsu or Precept sect is wrong because it is a thief. Here Nichiren apparently objected to the funds given this sect for social welfare activity. In any case, none of these prominent sects advocated the centrality of the Lotus Sutra. Eventually he came to include Tendai itelf because it was combined with Shingon teachings and rites. For him any compromise on the Lotus made them all false. Nichiren was a good scholar of history and knew the basic tenets of these groups, but he faulted them in their relation to the Lotus. His erudition is embodied in voluminous writings, especially five major texts which set forth the essence of his faith, Also he wrote numerous letters, sharing his ideas and sentiments with followers. Nichiren’s harshest criticisms were directed at the leaders of the nation, because they should know better. He was, to a degree, correct in his assessment of the Lotus Sutra. The power and influence of the Tendai sect at the time was evidence for Nichiren. It was the accepted understanding of Buddhism as the dominant teaching of the age. Modern scholars, however, recognize that the Lotus Sutra, as other Mahayana Sutras, were probably composed by anonymous authors from about the second or first century B.C.E to perhaps the second century C.E. However, Nichiren, and other teachers of his time simply assumed that the Sutras recorded actual history and sermons of the Buddha. They viewed the development of the Lotus from internal evidences in the texts. The Lotus was taught on Vulture Peak near the town of Rajagriha where he is said to have died. According to the Tendai interpretation of the Lotus and Nichiren, chapter sixteen reveals the Eternity of Sakyamuni Buddha, making him the supreme Buddha. All other Buddhas were manifestations from him as means of spiritually educating beings or providing worldly benefits. Nichiren is historically significant because of all Buddhists he was most concerned for the welfare of the nation and was in his time a Buddhist Activist. He had unflinching courage and commitment in a time of crisis. He confronted government and endured unrelenting abuse. In his major writings he appears to be critical and dogmatic. In his correspondence with followers, he was compassionate and empathetic. He endeared himself to his followers, though despised by his assailants. Beyond sectarian differences, he deserves our admiration.